The UV rays on the back of my neck were fierce. I rigged protection with a flannel cloth I found in the car: a fashion statement. 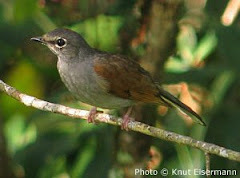 On a sunny Monday mornng, 14 July 2008, five Patzcuaro birders met at Ojo de Agua. We got excellent looks at birds with both binoculars and scope. A Canyon Towhee scratched around in the sun, showing off his breast streaks and spot which are difficult to see in the shade. We watched a Blue Mockingbird stealthily feed in low vegetation. Highlights were observing Golden-fronted Woodpeckers. A fledgling begged for food with fluttering behavior. A Black Phoebe and a Vermilion Flycatcher showed off in good light. We also saw a pair of Social Flycatchers and their nest. There were many other birds. Directions to Ojo de Agua [OA]: From Patzcuaro drive through Tsurumútaro to Tzintzuntzan. Pass the main plaza and you will come to a fork. Bear to the right in the direction of Quiroga. Watch the median and when it ends, immediately turn left into a small park at lake edge. Birding here is best on a week day when the park is not humming with activity. Next time I will take a chair and a snack to go with my water. Sun position is good for birding both morning and afternoon.